Problem: The out-of-home industry had not been valued as it should be, despite significant advances and improvements over recent years. The industry needed to give advertisers more reasons to consider outdoor advertising. Solution: Find a way to showcase out-of-home advertising’s key attributes of innovation, ubiquity and creative impact. The answer was a public celebration of great American art that inspired art appreciation, expanded knowledge about art, boosted national pride, and increased museum awareness. The original Art Everywhere campaign was launched in August 2013 across the United Kingdom. The campaign generated positive international press coverage and earned enthusiastic support from the arts community. 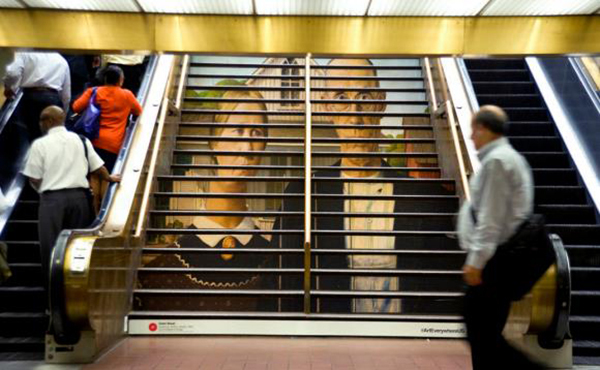 In late 2013, the US OOH industry endorsed a plan to bring Art Everywhere to America. The project encompassed many important industry interests, including the implementation of a strategic public service program that would promote public good, demonstrate OOH capabilities, and build new alliances within the arts community. Industry leaders believed that an Art Everywhere US campaign had the potential to inspire advertisers to take another look at OOH by demonstrating how and why OOH advertising can be used to make a considerable impact. The campaign also had the potential to earn substantial press coverage. The Art Everywhere US Advisory Committee, comprised of OOH media company stakeholders, provided strategic direction for the overall campaign. Five highly respected museum directors agreed to serve on an art selection team and lent their support in securing rights approval for the art, which would come from each of their museums’ collections. Maxwell Anderson, the Eugene McDermott Director at the Dallas Museum, led the group and was nominated to serve as the primary campaign spokesperson. The selection team included representatives from the Art Institute of Chicago, the Los Angeles County Museum of Art, the National Gallery of Art in Washington, DC, and the Whitney Museum of American Art in New York. The objective of the campaign was to demonstrate OOH capabilities in a way that created a positive association with the medium among advertisers, elected officials, regulators and the general public. Significant media coverage including national print, broadcast and social media was also a campaign priority. The campaign became an unprecedented collaboration among OAAA members that developed unity, community, purpose and industry pride. The five museums submitted 100 artworks that were organized online chronologically to represent a true history of American art. By acknowledging America’s many great artists, Art Everywhere US helped to boost national pride and spotlight the nation’s diversity. 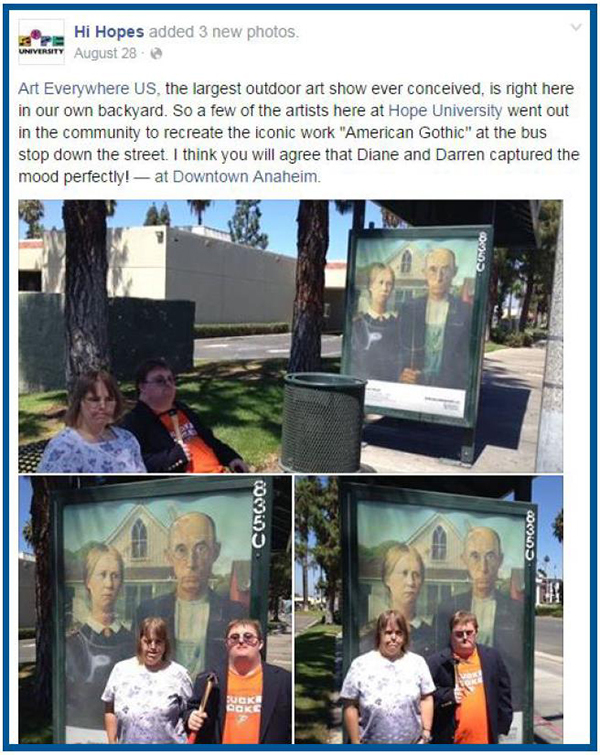 The public voted for the artworks they wanted to see on display in their communities, and the top 50 pieces of art were featured as the Art Everywhere US campaign. The museum directors added an additional eight artworks to ensure a robust history of American art was represented in the campaign. Following the voting period, art blogs and news outlets highlighted ArtEverywhereUS.org as an excellent resource to learn about American art history. 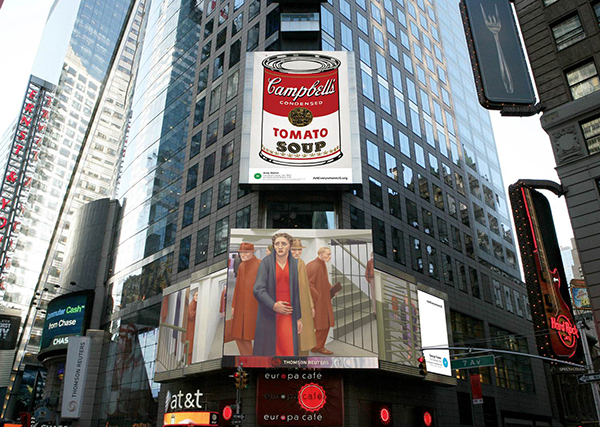 Voting took place on the ArtEverywhereUS.org website from April 7 – May 7. When the voting period closed, nearly 170,000 votes had been cast by the public. On June 21, the top 58 selected artworks were announced at a press event during the US Conference of Mayors in Dallas, TX. On site to make the announcement were Dallas Mayor Mike Rawlings, Los Angeles Mayor Eric Garcetti, and Washington, DC, Mayor Vincent Gray. Under the creative direction of Extra Credit Projects, a total of 710 layouts were produced so all 58 works of art would be represented across many different OOH formats, including static and digital displays. The campaign ran in 171 DMAs, with media planning and production managed by Outdoor Media Group/Outdoor Imaging. Eventually, more than 50,000 Art Everywhere US placements were featured across the country on space donated by 50 OOH media companies. 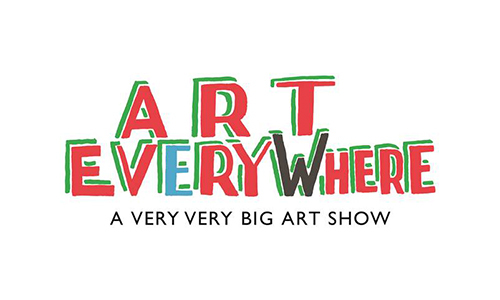 Art Everywhere US was officially unveiled on August 4, 2014 at a press event in New York, NY. Following the event, the press and public were invited to view the Art Everywhere US campaign on a variety of digital locations in Times Square. 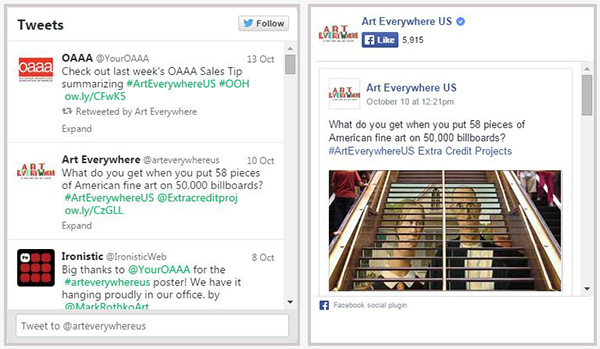 Art Everywhere US highlighted OOH’s relationship with social media. 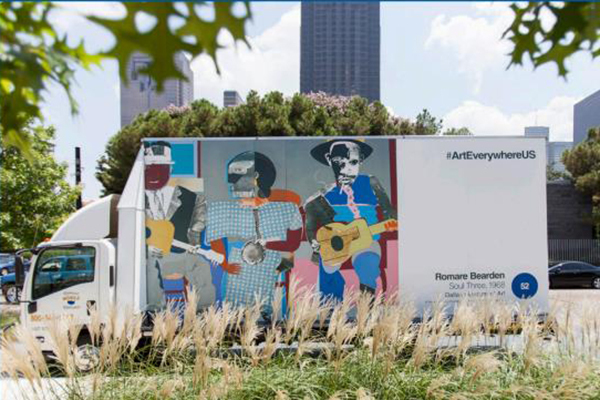 Using the hashtag #ArtEverywhereUS, social media users could tweet favorite artworks and share their enthusiasm about the campaign. 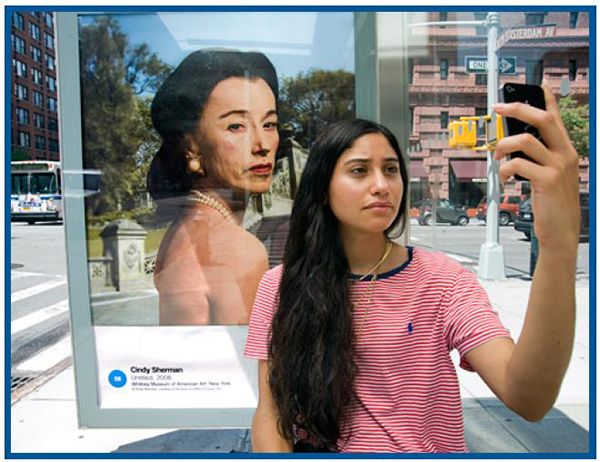 Pedestrians were invited to snap selfies with the art to share via Instagram, Facebook, Twitter, and other social media sites. 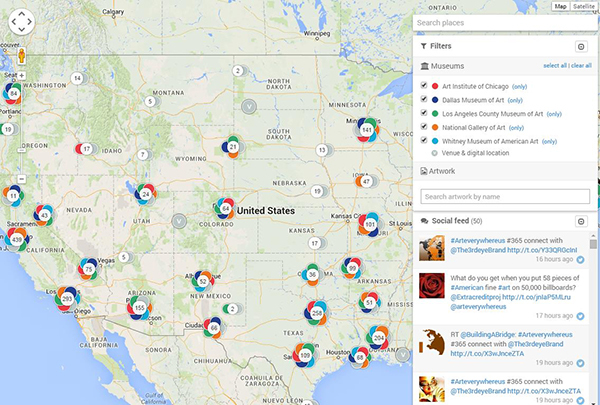 The public shared photos of Art Everywhere US sightings using social media. The website featured an interactive map created by Ayuda that pinpointed where the public could find specific artworks placed on various OOH locations around the country. The industry worked with augmented reality company Blippar to ensure pedestrians could further engage with the art via their smartphones. A selection of artworks gave users the option to scan the art with a smartphone and watch it come to life with information about the artist, the artwork itself, and the museum. An audio track was also available to provide even more information. The museum partners featured Art Everywhere US on their websites to encourage voting and promote the launch of the campaign. The Dallas Museum of Art developed a self-guided tour of the Art Everywhere US selections within the museum. The National Gallery of Art also developed a self-guided tour, urging patrons to take selfies with the original pieces. The Art Institute of Chicago placed plaques next to each artwork to identify it as an Art Everywhere US piece. 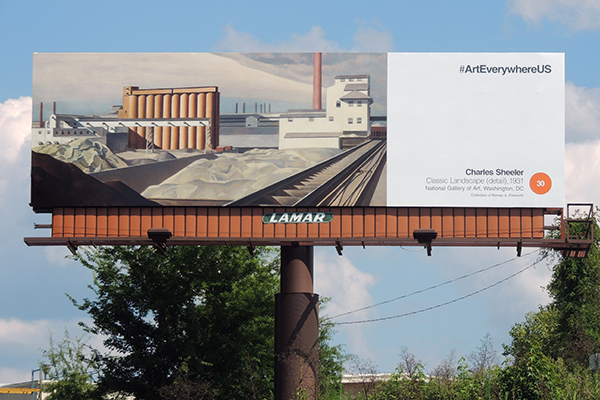 The Art Everywhere US campaign inspired art appreciation across the country – from major cities to small towns. The campaign helped expand knowledge about American art and artists, both past and present, exposing Americans to art history and the masterworks found in many of the nation’s finest museums. Nearly 18 million people were aware of Art Everywhere US either prior to the launch or during the campaign, and Art Everywhere US earned more than 2.34 billion OOH impressions. In total, the campaign was valued at more than $20 million. According to Nielsen research, among those who saw the artwork, nearly 78 percent (77.9%) felt much more interested in visiting an art museum as a result of seeing the Art Everywhere US campaign. More than 7 in 10 who saw the artwork (71.4%) felt they appreciate American art much more. The campaign generated more than 50 million social media impressions. More than 1,000 media clips were in print or posted online about Art Everywhere US, including coverage in major news outlets such as Forbes, The New York Times, Chicago Tribune, Los Angeles Times, The Wall Street Journal, The Washington Post, USA TODAY, and PBS. The campaign also earned placement in publications and on websites where OOH is not typically featured, such as Architectural Digest, Women’s Wear Daily, Voice of America and VOGUE.com. 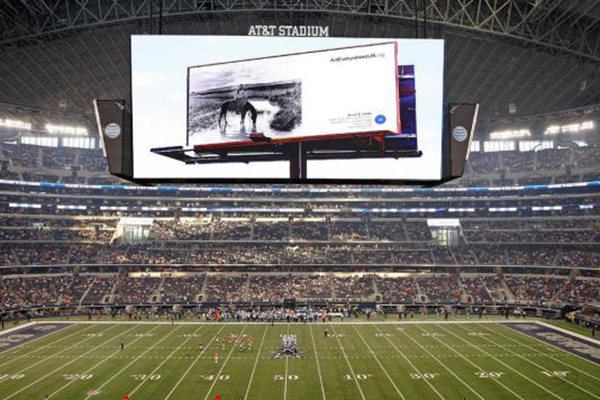 The Dallas Cowboys featured images from the campaign on AT&T Stadium’s famous digital scoreboard during a preseason game against the Denver Broncos. Art Everywhere US created buzz in Congress. US Representatives and Senators posted on social media about art connections to their states. Reps. Billy Long (R-MO) and Steve Cohen (D-TN) published statements in the Congressional Record on June 25 and July 28, respectively, noting local artists represented in the national art show. On August 14, Sen. Barbara Mikulski (D-MD) and Sen. Michael Enzi (R-WY), Co-Chairs of the Senate Cultural Caucus, sent a letter to all US Senators explaining the campaign and directing them to the Art Everywhere US website. In August 2014, cherished American art was seen by millions of Americans as they engaged in their daily routines away from home – commuting to work, taking the kids to soccer practice, hailing a taxi, shopping in a mall, catching a bus, and other routine activities. In the end, Art Everywhere US helped bring great art to art lovers everywhere.